June 2017 : Habilitation à Diriger les Recherches from University Pierre and Marie Curie. 2007-2010 : PhD at Onera in the optic department. 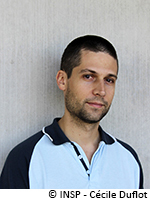 (Emmanuel Rosencher as PhD advisor) - Transport in weakly coupled superlattice. In collaboration with laboratory MPQ (Paris 7) and Thales R&T.